Most companies no longer need to be sold on the advantages of digitalization. Everywhere we look, organizations are embracing artificial intelligence, the Internet of Things, cloud technology, robotics, and mobile connectivity to enhance workforce engagement, business productivity, and the customer experience. And this level of acceptance will continue to grow as emerging technology, such as blockchain and augmented reality, appear on their radar as well. But despite all the boardroom talk, significant investments, and sweeping deployments, few businesses are achieving the kind of growth that today’s technologies are designed to deliver. For the vast majority, they are unable to fully harness the intelligent functionalities and skills – such as artificial intelligence, the Internet of Things, and cloud technology – to move to the next level of their competitiveness. The one thing all technologies have in common with each other is data at their core, which can be used to enhance every aspect of the business. As the volume of information grows, processes become more intelligent as the right data sets are combined and converted into real-time insights that later become superior business decisions. Companies that apply this growing knowledge base will have the edge over their competition. By putting data and intelligence at the center of everything they do, their business models improve incrementally over time, realizing benefits quickly and reducing the risk of disruption. Each of these digital movers and shakers is what we call an Intelligent Enterprise. For intelligent enterprises, undergoing this level of change is about more than just creating short-term value for their shareholders. It’s also about getting into a better position to thrive and transform their industry and their marketplace – which is a high-stakes promise considering the US$3.5 trillion in annual value that is created in enterprises with artificial intelligence alone. SAP Digital Business Services is uniquely positioned to guide SAP customers towards their transition into an Intelligent Enterprise. Our outcome-targeted services and proactive support offerings empower companies to adopt the vision and set the foundation for a lean enterprise structure that is highly focused, agile, and data-driven. Move to a digital core: A modern digital core is a prerequisite for reaping the full benefits of the Intelligent Enterprise. We help our customers quickly and safely adopt SAP S/4HANA through our expert end-to-end business case, planning, implementation, and migration tools and services. Take advantage of the cloud: Cloud technology helps our customers swiftly adopt a suite of best-in-class solutions with increased agility. It also supports decision-making based on intelligence that is pulled from every aspect of the business – from the edge of the customer experience to the core of back-office operations. Enable innovation at scale: Our portfolio of innovation services and support empower our customers to build and scale new business models and rotate old processes to leverage intelligent technologies such as SAP Leonardo Services. Empower continuous success: Customer success management enables our customers to continuously increase business value realization and realize their desired business outcomes more quickly. Connect the entire business: Promote close collaboration across all organizations, roles, and locations to generate exceptional business outcomes. By embracing these fundamentals of an Intelligent Enterprise, SAP Digital Business Services and our customers work together to clarify a strategic vision for unlocking the full potential of technology. But more importantly, we help our customers acquire the focus, agility, and simplicity needed to open up industry-disruptive opportunities. 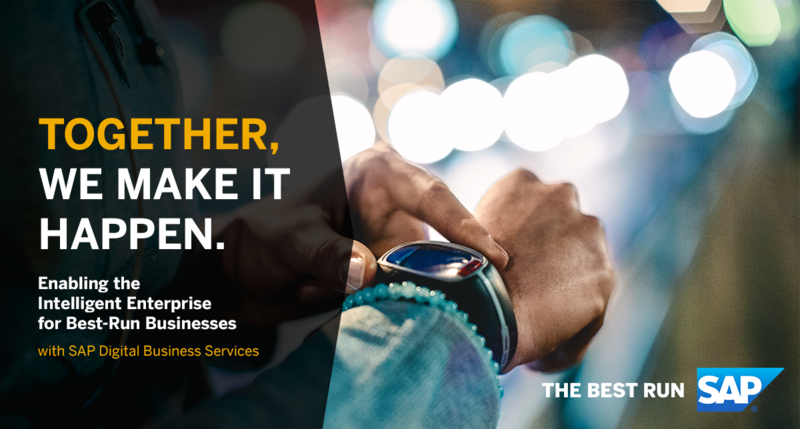 We hope you join us over the next few months as we give full insight into how you can accelerate your own journey towards becoming an Intelligent Enterprise. We will examine the benefits and requirements of running an Intelligent Enterprise, take a look at the options you can choose to achieve your goal, and share best practices that have helped our customers realize their full potential now and for years to come. And explore our customers stories running already live with their next generation ERP Suite. Make sure to share this story on LinkedIn.